After 5 p.m. on May 21, tickets will only be available through the Benaroya Box office at: (206) 215-4800. The box office will be open starting at noon on Sunday, May 22. The Benaroya Hall Box Office is located on the street level at the corner of Third Avenue and Union Street, at the north end of The Boeing Company Gallery in Benaroya Hall. MOR is a proud member of TeenTix! Click here to learn more about how teenagers (13-19 years old) can get $5 tickets to any of our concerts! 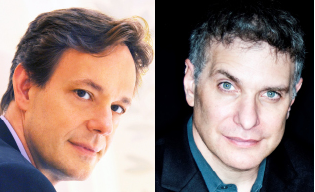 Join us for a pre-concert interview with composer Jake Heggie and Librettist Gene Scheer! On May 22, 2016 you’ll experience an event that the entire musical world is awaiting: the world premiere of Out of Darkness, the new MOR commission from composer Jake Heggie and librettist Gene Scheer. The compelling two-act opera is a powerful portrait of survival that conveys the vastness of the Holocaust’s scope through emotionally rich depictions of those caught in its grasp. Based on true stories of two survivors haunted by the ghosts of their past, Out of Darkness offers compelling musical witness to survival in the face of unimaginable adversity. The opera relates the amazing true story of Krystyna Zywulska, whose daring poems became anthems of defiance among her fellow prisoners in Auschwitz, and explores the fate of homosexuals during the Holocaust through the experience of Gad Beck and Manfred Lewin, two idealistic young lovers in 1930s Berlin whose lives and loves were torn apart under Nazi rule. "Mr. Heggie may well be the richest, most accessible, most captivating opera composer since Benjamin Britten...He reduces major universal issues to credible personal stories, to which a listener can connect."